Whether you’re an experienced web designer looking to add some interactivity to your websites with menus and image slideshows, or a beginner who is just curious to learn more than just the basics of jQuery, here’s something that should interest you. 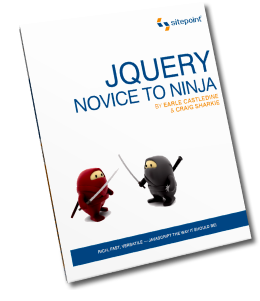 Sitepoint is giving away their 400-page jQuery book – jQuery: Novice to Ninja – for free – absolutely no strings attached. The books covers almost every aspect of this popular language with real-world examples and should appeal to users of all skill levels. To download the book, all you have to do is provide your email address to them and they’ll send you the download links in your inbox. This giveaway is live for the next 12 hours. It is part of their 'The Cup' promotion. The downloads are available as PDF, MOBI and EPUB format so you can read the jQuery e-book on virtually all devices including your mobile phones, your e-reader and the desktop of course. This book is available at no cost for a VERY limited time. So, Download it and spread the word. Tell your friends!